We’d love your help. Let us know what’s wrong with this preview of Stone Soup by Jon J. Muth. Three strangers, hungry and tired, pass through a war-torn village. Embittered and suspicious from the war, the people hide their food and close their windows tight. That is, until the clever strangers suggest making a soup from stones. Intrigued by the idea, everyone brings what they have until-- together, they have made a feast fit for a king! In this inspiring story abo Three strangers, hungry and tired, pass through a war-torn village. Embittered and suspicious from the war, the people hide their food and close their windows tight. That is, until the clever strangers suggest making a soup from stones. Intrigued by the idea, everyone brings what they have until-- together, they have made a feast fit for a king! To ask other readers questions about Stone Soup, please sign up. Student 1: "I noticed, this book didn't win an award." Student 2: "It should have." Student 3: "Let's give it an award." Student carefully cut out his own version of the Caldecott award and taped it to the cover. Student 4: "Now everyone who reads it will know that it won an award." Of all the books I read my kids Jon J. Muth's Stone Soup is far and away my favourite. Not only is it a beautiful retelling of a classic tale, it is the finest telling of the tale I have ever seen. Muth's watercolours are exquisite: sparing, richly detailed, perfectly moody and expressive. And his choice of setting is sublime. Muth sets his version in a small walled village at the base of a mountain in China. Three monks come to the town one morning and start making stone soup, drawing the village Of all the books I read my kids Jon J. Muth's Stone Soup is far and away my favourite. And his choice of setting is sublime. Muth sets his version in a small walled village at the base of a mountain in China. Three monks come to the town one morning and start making stone soup, drawing the villagers -- suspicious from many hardships -- out of the their homes and into each others hearts. What's all this socialist mumbo jumbo? A touching book based on a folk tale common in many cultures (with different variations) about how working together and sharing can create happiness and a bond within a community. 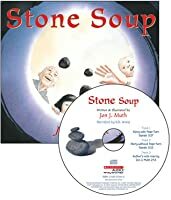 “Stone Soup” is a very old folktale with variations and retellings set in countries around the world, in various historical periods, and featuring different characters. Most versions feature hungry strangers who persuade locals to share their resources, and often there is a lesson of cooperation and generosity, even in times of hardship and scarcity. 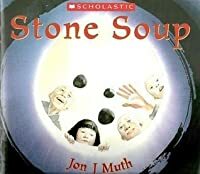 In my preschool classroom (of 3 to 5 year olds), we spent several weeks investigating a series of illustrated children's books based on this folkta “Stone Soup” is a very old folktale with variations and retellings set in countries around the world, in various historical periods, and featuring different characters. Most versions feature hungry strangers who persuade locals to share their resources, and often there is a lesson of cooperation and generosity, even in times of hardship and scarcity. In my preschool classroom (of 3 to 5 year olds), we spent several weeks investigating a series of illustrated children's books based on this folktale about making soup from stones (or cactus needles or nails). Through focused engagement with geographically-, culturally-, and historically-specific retellings of the folktale, we have been able to integrate literacy, geography, cultural studies, cooking, dramatic and constructive play, and scientific inquiry into our classroom life. Jon Muth's Stone Soup was my favorite version in our series, as it had richly nuanced illustrations and kindhearted characters. In addition, it focused more on lessons of compassion, empathy, and caring than the other versions. Stone Soup. / Jon Muth. / 2003. "Three wise monks trick a poor, frightened community into finding happiness by teaching them the magic of generosity" (NoveList). "Muth has taken this old tale and transplanted it from its traditional European setting to China. The tricksters are no longer hungry travelers or soldiers but Buddhist monks. Their goal in fooling the villagers is not to fill their own stomachs but rather to enlighten them about the happiness that comes from sharing. Muth's characteristic watercolor illustrations, with their striking use of misty hues contrasted with bright primaries, are expertly done and convey a distinct sense of place" (Grace Oliff in School Library Journal). I enjoyed this book, but I'm not sure that my niece did. She struggled a lot with figuring out why anyone would want to eat soup made with stones, so I'd have to say that the larger point presented in this great story was lost on her. We may try this one again when she's a little older. The best retelling of this classic story that we've seen. Reading the insights on the back page really bring what the author is doing to life. Probably my favorite version of this famous tale. Stone Soup is the story of 3 brothers who are monks and have been traveling. They are weary, and questioning things such as what makes someone happy. They come to a village, where the villagers seem angry and do not communicate well with each other. They are shut up in their houses and will not help the monks find a place to rest. The monk brothers decide to make a pot of stone soup, as they are hungry, and a little girl watches. She is curious as to why they are boiling stones in such a small pot. She offers the use of one of her mother’s larger pots for the monks to use to boil their stones. The villagers watch from their homes, and are intrigued by this act of kindness. They wonder too, what are those monks doing? One by one the villagers emerge from their homes….and the rest is to be read by you! This story is a traditional fable, that has been told by many authors in several stories. This particular version has amazing watercolor drawings that are from the perspective of the monks, inside the soup bowl, the outside looking in, and scenes of the village. All of the pictures contain a black cat, which is funny because one of the things the monks were speculating before entering the village was a cat’s whiskers! It is traditional because it has a very clear beginning, middle, and end. It has a light moral, and the story is very vague. It can take place almost anywhere, in any culture. It has 3 monks, a wise and curious child, and the story spans a very short time. It is a timeless piece loved by many children. The 1948 version of Stone Soup, written by Marcia Brown, won the Caldecott Honor Book award, which is given to the most distinguished American picture book from the previous year. This book is a timeless classic, and many authors and illustrators expanded and reimagined this fun and light fable. The opening of the story introduces the main characters- the monks Hok, Lok, & Siew. The introduction of the characters as an opening for a story has global roots, and sets up the folktale so that details are not wasted. The end of the story states the moral of the tale, that is the importance of sharing what you have to make a more plentiful whole. Though the moral was obvious, it was not stated in "the moral of the story..." style of Aesop's fables. The primary setting is a village full of The opening of the story introduces the main characters- the monks Hok, Lok, & Siew. The introduction of the characters as an opening for a story has global roots, and sets up the folktale so that details are not wasted. The end of the story states the moral of the tale, that is the importance of sharing what you have to make a more plentiful whole. Though the moral was obvious, it was not stated in "the moral of the story..." style of Aesop's fables. The primary setting is a village full of distrustful people who isolated themselves. The monks started their journey on the road before they came upon the village. The village represents the familiar, lending a universal theme that this isolation can happen anywhere. The main characters are Hok, Lok, & Siew. They are monks and are considered to be wise. They are joined by a little girl. Slowly, the rest of the villagers come an join, such as the scholar. The monks travel and come upon a village that was distrustful and isolated. The monks see this and decide that they are going to teach the village how to make stone soup. Slowly, the villagers make their way out to the center of the town to see the monks make stone soup. The collaborative effort of the soup, where each member of the village contributed, was started by a curious little girl. As everyone contributes, they come together as a village to eat and share stories. They learn how to share and how to care for one another again, and the wonderful things they can gain by doing so. Summary: A classic fable is wonderfully retold in Jon Muth’s “Stone Soup”. This beautiful watercolor rendition follows three monks as they travel through a mountain landscape and stumble upon a small village. As the monks enter the village, no one is to be found. Doors are locked and windows shut tight as the monks decided that the villagers need to learn how to make “stone soup”. A brave girl approaches and questions the monks. After she retrieves a bigger pot for the soup, the curious villagers begin to appear and what follows is an important lesson about generosity, sharing, and the importance of community. The book Stone Soup by Jon J. Muth is about three monks who come across a village. The village has grown accustomed to not being comfortable with strangers or new people to the village ever since the war. The village is protected by a wall and a gate . When these three monks cross by the village they noticed the gate was open, but when they walked through the village, no one was to be seen. All of the doors were shut and all of the windows were closed. Then the monks came across a little girl wi The book Stone Soup by Jon J. Muth is about three monks who come across a village. The village has grown accustomed to not being comfortable with strangers or new people to the village ever since the war. The village is protected by a wall and a gate . When these three monks cross by the village they noticed the gate was open, but when they walked through the village, no one was to be seen. All of the doors were shut and all of the windows were closed. Then the monks came across a little girl within the village. A girl so young she was not acting like the other villagers hiding and avoiding the monks. She instead began to talk to them; she even became to help them. 3 monks; Hok, Lok, and Slowe travel through the mountains of China, finding a distraught village and make themselves known. Hok, Lok and Slowe work together to make their favorite delicious stone soup and in the process the village comes together to enhance the soup. At first the monks come into the village alone with no help and no acknowledgment from the villagers. But it only takes the curiosity of a young girl for the other villagers to realize the kindness of these monks and the enlightenme 3 monks; Hok, Lok, and Slowe travel through the mountains of China, finding a distraught village and make themselves known. Hok, Lok and Slowe work together to make their favorite delicious stone soup and in the process the village comes together to enhance the soup. At first the monks come into the village alone with no help and no acknowledgment from the villagers. But it only takes the curiosity of a young girl for the other villagers to realize the kindness of these monks and the enlightenment that they would bring to the village. Learning that sharing and coming together will always make everyone happier. The 3 monks leave the village a changed place with their message learned. John Muth the author of this book does a terrific job in creating a masterpiece of culture, moral and a light storyline. In the book John is able to illustrate such a great message in a light upbeat way. John use of watercolors and simple illustrations of the characters and the environment around them, his descriptive words of the characters only help to enhance the storyline and the simplistic illustrations let the words stand out more. The illustrations throughout the book also help to tell the story by showing light glances into the culture of the village and the descriptions of the characters. This book is captive in its words, light with its illustrations but tells the reader a grand story; overall it is a terrific book for any age. In this book, there were three main characters that consisted of the three monks. Their names were Hok, Lok, and Siew. They were walking along a mountain when they ran into a village that they could see down below. The village people were weary of newcomers because of all the problems they have had with strangers in the past. Not being discouraged, the three monks started cooking soup in the courtyard of the village to try and join everyone together. The opening was not your typical "Once upon a In this book, there were three main characters that consisted of the three monks. Their names were Hok, Lok, and Siew. They were walking along a mountain when they ran into a village that they could see down below. The village people were weary of newcomers because of all the problems they have had with strangers in the past. Not being discouraged, the three monks started cooking soup in the courtyard of the village to try and join everyone together. 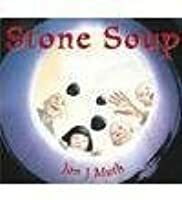 Stone Soup is a traditional story involving a town who has gone through some hardships. The towns people don't live as a community anymore and doesn't interact with each other. The town is soon visited by three monks who feel they need to bring happiness back to the towns people. They decide to introduce them to their stone soup. They begin to brew their stone soup and towns people come out of their homes to see what the monks are doing. The story evolves into a lesson of community and friendshi Stone Soup is a traditional story involving a town who has gone through some hardships. The towns people don't live as a community anymore and doesn't interact with each other. The town is soon visited by three monks who feel they need to bring happiness back to the towns people. They decide to introduce them to their stone soup. They begin to brew their stone soup and towns people come out of their homes to see what the monks are doing. The story evolves into a lesson of community and friendship. It is a warm read that will leave you a feeling of happiness as the monks intended. 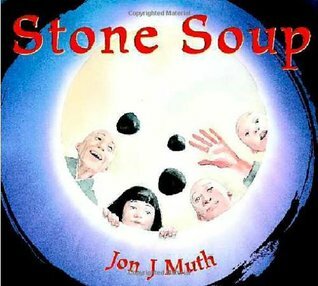 Stone Soup by Jon J Muth is a classic story about sharing and kindness. I have read many versions of this story and it is always one of my favorite folktales. Muth’s version has beautiful, tranquil watercolor artwork that is just as much part of the story as the words in the book. The story opens with three monks; Hok, Lok, and Siew on a trek, they are discussing what makes one happy when they come across an unhappy village. The monks venture inside only to be turned away by all the inhabitants. 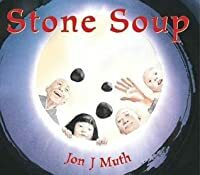 Stone Soup by Jon J Muth is a classic story about sharing and kindness. I have read many versions of this story and it is always one of my favorite folktales. Muth’s version has beautiful, tranquil watercolor artwork that is just as much part of the story as the words in the book. The story opens with three monks; Hok, Lok, and Siew on a trek, they are discussing what makes one happy when they come across an unhappy village. The monks venture inside only to be turned away by all the inhabitants. The monks decided to make stone soup. This curious scene brought out a child. She then brought a pot and even helped the monks find the stones. Their good deed and the little girls willingness to help set the entire village in motion. The monks are able to entice the villagers out of their homes and to share their things with everyone else. The theme of this book could be about helping your neighbor, or paying it forward. The more someone gave in the story the more the next person wanted to help. Jon J Muth is an award winning (Caldecott Honor Book) author and illustrator. Stone Soup is the winner of National Parenting Book Award. The art and story telling are something that will stay with the reader for years to come. In this folktale, three monks are traveling through a mountain discussing what true happiness is. They come across a village where the villagers are not friendly to outsiders or to each other – no one wants anything to do with the monks, and they do their best to avoid them. The monks decide to teach the villagers a lesson on how to be happy by making stone soup. They villagers become curious and begin to join the monks in making the soup. The story opens in a pretty common way, with the main ch In this folktale, three monks are traveling through a mountain discussing what true happiness is. They come across a village where the villagers are not friendly to outsiders or to each other – no one wants anything to do with the monks, and they do their best to avoid them. The monks decide to teach the villagers a lesson on how to be happy by making stone soup. They villagers become curious and begin to join the monks in making the soup. The story, Stone Soup, takes place in ancient China. The story starts off with three monks climbing a mountain and discussing what happiness is. When they reach the top of the mountain they see the top of a small village. The three monks go to this village but no one is in sight. They had all locked their doors and shut their windows. They did this because the villagers are weary of strangers. The village has been starved and strained. All of the villagers were trying to protect their resources. The story, Stone Soup, takes place in ancient China. The story starts off with three monks climbing a mountain and discussing what happiness is. When they reach the top of the mountain they see the top of a small village. The three monks go to this village but no one is in sight. They had all locked their doors and shut their windows. They did this because the villagers are weary of strangers. The village has been starved and strained. All of the villagers were trying to protect their resources. The three monks would make stone soup. Out of nowhere a little girl approached them to help them make the soup. This started a domino effect causing the whole village to get involved. In my opinion, the main literary element in this story is the character development. The author portrayed the villagers as weary of strangers, but the little girl stood out from the rest and offered to help. She was the bridge between the villagers and the three monks. Although the setting wasn’t clearly stated in the text, the visual elements illustrated where this story was taking place. This is an example of how important visual elements are. The illustrations also showed how the characters transformed from unhappy characters to joyous ones. In this version of the story travelers convince skeptical town of people into providing the ingredients for a wonderful soup by telling them it is made from stones. While individuals may have only contributed one ingredient, when the soup is complete it is a wonderful combination of many ingredients. This folk tale has been told from many cultural perspectives, set in a time of despair or famine, yet a wonderful soup is created in each version as ingredients are added one by one. The message shin In this version of the story travelers convince skeptical town of people into providing the ingredients for a wonderful soup by telling them it is made from stones. While individuals may have only contributed one ingredient, when the soup is complete it is a wonderful combination of many ingredients. This folk tale has been told from many cultural perspectives, set in a time of despair or famine, yet a wonderful soup is created in each version as ingredients are added one by one. The message shines through each version of this tale - when we all work together amazing things can happen. Although this book, a 2-3 grade reading level, it makes a great project for younger aspiring readers as well. If a teacher is ambitious and has the help of other adults, students could bring in the various ingredients from the story and make the soup. A friend and I did this at a library event and it was a big success. Due to health regulations, food allergies, etc. this could also be acted out with foods from a play kitchen. Allowing all students to contribute as the story is read to the group creates relevance and meaning for the message within the story. Stone Soup opens on 3 monks who come across a village. The people of the village are talented, but they do not know how to work together. The monks plan to introduce the villagers to stone soup, and collaboration in the process. Stone Soup did not open with a line like once upon a time, instead it starts by introducing the main characters of the story, the three monks. The main story is set in a village that the monks travel to. The characters are not described well, but we can glean that they a Stone Soup opens on 3 monks who come across a village. The people of the village are talented, but they do not know how to work together. The monks plan to introduce the villagers to stone soup, and collaboration in the process. Stone Soup did not open with a line like once upon a time, instead it starts by introducing the main characters of the story, the three monks. The main story is set in a village that the monks travel to. The characters are not described well, but we can glean that they are wise and good. They could be called the heroes of the story. There’s no fantastical magic in this story, just the power of working together. The moral in the story is that alone we have little, but together we have plenty. The plot is driven by the monks desire to make stone soup, but always needing just one more ingredient. The villagers see that together they can make stone soup better. A motif in the story is the young daughter, the first open person willing to help. The story does not end with a traditional closing, instead it references the simplicity of the lesson learned by the villagers. I thought this book was great! The illustrations had a spiritual feel throughout the book. The story line flowed beautifully with a clear message that most children could understand on their own. The story tell a tale about three monks who are in search of what makes people happy. They come across a town where no one seems friendly because they turn off their lights and lock the doors. The monks talked with each other about making stone soup and little girl walks by and is interested about makin I thought this book was great! The illustrations had a spiritual feel throughout the book. The story line flowed beautifully with a clear message that most children could understand on their own. The story tell a tale about three monks who are in search of what makes people happy. They come across a town where no one seems friendly because they turn off their lights and lock the doors. The monks talked with each other about making stone soup and little girl walks by and is interested about making stone soup. The monks were pleased to hear someone was talking with them. They sent her to go find ingredients and eventually people started to notice what she was doing and wanted to help the monks too. The towns people had no idea what this soup was going to taste like but the monks knew and had a secret about the soup. The 3 main characters, wise monks Hok, Lok, & Siew are instantly introduced in the opening of this story to set the narrative bringing you closer to the cultural window.The setting takes you on the monks journey to a deserted village, the monks take the initiate to teach the locals how to make their stone soup. Food is always a great way to bring people together, as you assume, the village comes together, led by a little girl to create memories over their stone soup. Once you get the idea of The 3 main characters, wise monks Hok, Lok, & Siew are instantly introduced in the opening of this story to set the narrative bringing you closer to the cultural window.The setting takes you on the monks journey to a deserted village, the monks take the initiate to teach the locals how to make their stone soup. Food is always a great way to bring people together, as you assume, the village comes together, led by a little girl to create memories over their stone soup. Once you get the idea of the moral of the story hits key points such as sharing and positive moral value traits, the story concludes with a positive rush running through your body. Jon J. Muth is an American comic artist. His works include J. M. DeMatteis' graphic novel Moonshadow, Neil Gaiman's The Sandman: The Wake (along with Michael Zulli, Charles Vess), Mike Cary's Lucifer: Nirvana and Swamp Thing: Roots. Muth has gone on to an award-winning career as a children's book writer and illustrator. He received a Gold Medal from the Society of Illustrators for his illustration Jon J. Muth is an American comic artist. His works include J. M. DeMatteis' graphic novel Moonshadow, Neil Gaiman's The Sandman: The Wake (along with Michael Zulli, Charles Vess), Mike Cary's Lucifer: Nirvana and Swamp Thing: Roots. Muth has gone on to an award-winning career as a children's book writer and illustrator. He received a Gold Medal from the Society of Illustrators for his illustrations in Come On, Rain! by Karen Hesse. He has also created a version of the Stone soup fable set in China.